Giving you more reasons to smile. Acrylate polymer (PMMA) blocks for the fabrication of long-term temporaries using CAD/CAM technology. These restorations are either milled in the dental practice utilizing a chairside design/milling system or in the dental laboratory. The restorations can be polished quickly and efficiently or they can be characterized with stains. Furthermore, incisal areas may be customized with light-curing layering materials to attain highly esthetic results. Temporaries can be easily reproduced. Radica® is a system for provisional and diagnostic restorations from Dentsply Prosthetics. Based on a visible light curing (VLC) composite platform, Radica has been developed to exceed the performance criteria of currently available restorations. It has been proven in clinical study. 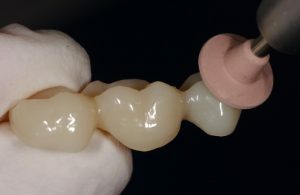 A simple lab process offers the dual benefits of using the system for a truly lifelike diagnostic system as well as a provisional restoration.